Barring any unforeseen incident like injuries, contract situations, etc., five NBA All Star Golden State Warriors could be wearing the USA national colors in a pair of international competitions scheduled next year and two years from now. The FIBA Basketball World Cup won’t be held until August next year in China and the 2020 XXXII Games of the Olympics July in Tokyo, but this early, Warriors Stephen Curry, Kevin Durant, Draymond Green, Klay Thompson a and the newly signed DeMarcus Cousins sure have all received invitations from USA Basketball to try out for memberships in Team USA. And, most-likely, barring those factors mentioned, all stand to make it to carry America’s red, white and blue uniforms for the two biggest and most prestigious tournaments in the world in the sport. The appointment of Golden State head coach Steve Kerr as assistant to head mentor Gregg Popovich further bolstered that consensus. Curry and Thompson, expressed excitement with the thought of bringing the “splash brothers” kind of play to the World Cup and the Olympics. 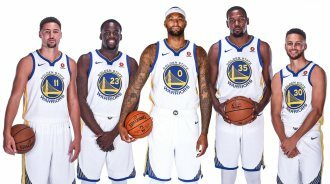 The five Warriors possibility teaming up for Team USA will depend though on whether Cousins will still be with Golden State next year and the Warriors aren’t convinced Durant will be either, but there is still a bond. Durant has two Olympic gold medals (2012 and 2016), while Green, Cousins, and Thompson each have one in 2016. Curry when healthy sure would want to add an Olympic gold medal to his resume, to go with his two World Cup golds. Although he jestingly said that Kerr being the coach meant he didn’t want to go anymore. Curry, would’ve represented USA two hears ago in Rio de Janeiro, but missed the chance due to injury. "Obviously there's a lot to pick from. ...We'll see what happens." Since the pros were given he go signal to play in the Olympics in Barcelona in 1992 he Magic Johnson-led Team USA annihilated the opposition, there has not been a time when five players from single team played for the US in the Summer Olympics or world championships.